When it comes to ramping up the productivity of your meetings, why not consider adding a rooftop element! There are many rooftop venues in London that you can hire. These hotels will enhance the delegate experience at your next big meeting, event or conference. Some hotels’ rooftop areas offer a scenic panoramic 360-degree view of London city, providing a truly exciting backdrop for a corporate event. For the best rooftop venues to hire in London, you will find that you have options galore. From organising a boardroom style meeting and having a refreshments’ break to having a BBQ lunch with colleagues and conference attendees. Choose a hire venue based on your budget and the number of people attending the event. Choose a venues that offers a trendy and unique atmosphere. Or opt for a venue which combines the perfect setting for both informal and casual meetings. Whatever your needs, these venues will ensure that your meetings are productive and your attendees are happy. Whether you wish to get industry stalwarts to speak on a game-changing business topic or organise an informal meeting for your team, you can do so in a hotel’s meeting and events’ spaces. At the same time, if the hotel has a rooftop restaurant or bar, you could put it to good use by serving refreshments in this area. Perfect in the summer with the warm golden sunshine creating a buzz among delegates! Our list of 4 hotels in London that have a spectacular rooftop setting follow! Getting a little innovative with your style of conducting an official meeting or organising a conference can help create a lasting impact. Why not make your company the talk of the town? Invite your guests for a refreshing tea and breakfast pastries before the start of your meeting. 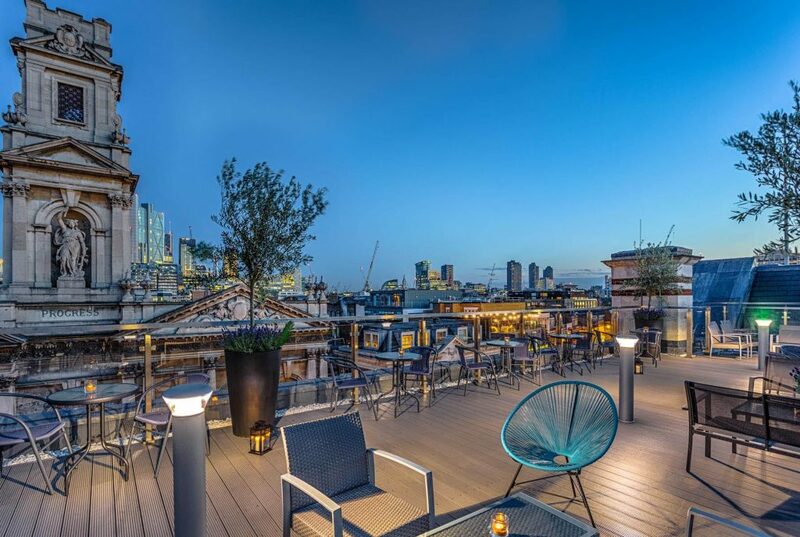 Give them an inspiring rooftop view of London and the sky’s the limit! The Courthouse Hotel London has a myriad of choice. Whether you want a purely fun-filled event on the hotel’s rooftop, or a meeting room with additional access to the terrace, you’re covered. The Toy Roof at the Courthouse Hotel London overlooks the famous Carnaby Street in Soho. It is the epitome of trendy London. Providing customers with the highest level of service, delegates and guests can enjoy scrumptious food and a relaxed atmosphere. With the ability to accommodate 80 people when standing and seating 60 people, the Toy Roof makes for a great rooftop venue to hire in London for an energising and interactive conference session. If you are looking for unique rooftop venues in East London, then the Courthouse Hotel Shoreditch needs to be at the top of your list! Shoreditch is known for its eccentricity and vibrant nightlife. This hotel capitalises on these unique features of the city. 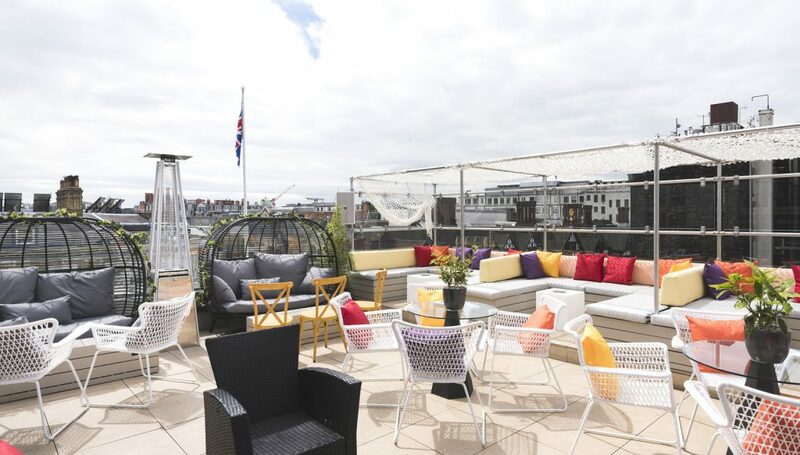 Corporate events can have a serious yet relaxed atmosphere at the hotel’s rooftop terrace, Upper 5th Shoreditch. With a reception style setup, you can have up to 200 attendees gracing your next corporate event or conference. You can organise a more formal meeting in one of the five meeting rooms that have been specifically designed to accommodate both smaller and larger groups. 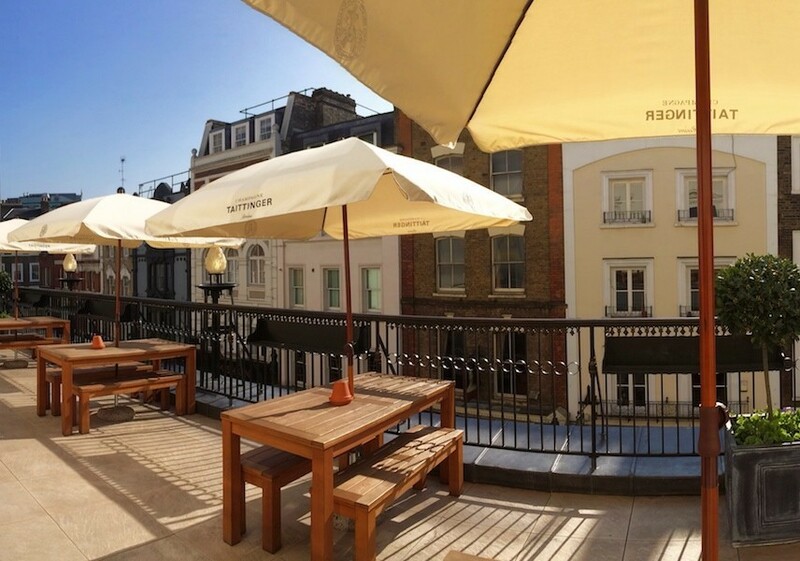 After a productive and strenuous few hours of business, you can then treat your team or attendees to the relaxed vibe on one of the best rooftop venues available for hire in London. From this rooftop terrace, you can savour the breathtaking views of the London skyline. Catering services ensure that people with different dietary requirements are well looked after. So, if your attendees are vegan or gluten-free, their needs can be easily accommodated. Additionally, on summer days when the weather is bright and sunny, you can even opt for the Courthouse Hotel Shoreditch BBQ offering! It’s an excellent way to network at corporate events. 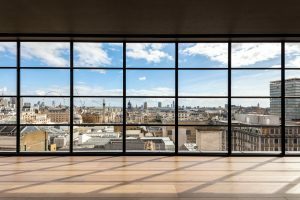 There are plenty of options for unique rooftop venues in West London. 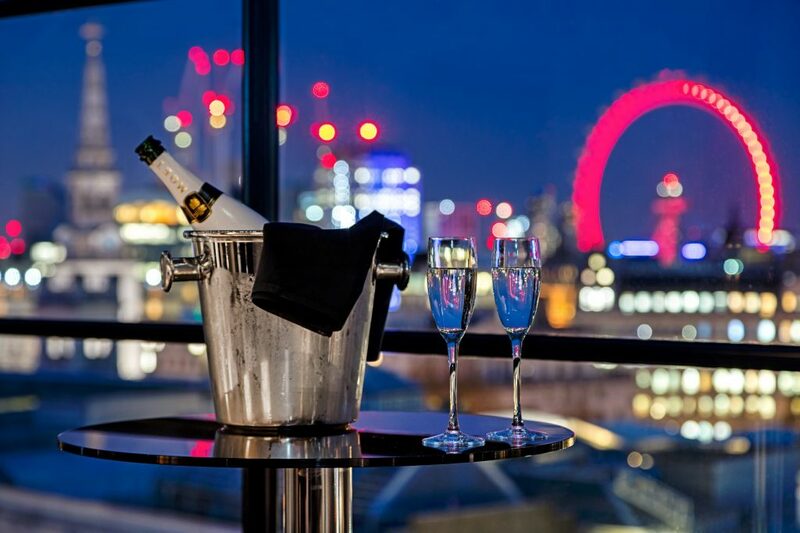 To make the most of the exciting London skyline and views over the London Eye, the BT Tower and the River Thames, choose the Radisson Blu Edwardian Hampshire Hotel. 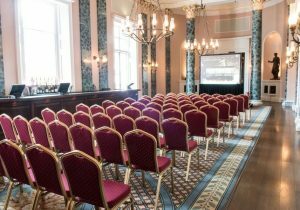 This on-trend London hotel also offers event organisers the very latest digital technology for meetings and conferences. Consisting of six function rooms which can be transformed into elegant meeting spaces, conducting an annual board meeting or corporate event at the Radisson Blu Edwardian Hampshire Hotel will be the talk of the town with delegates. The meeting spaces at the Radisson Blu Edwardian Hampshire Hotel can support 100 people. Both functionality and aesthetics are highly valued at this hotel. This is evident from the moment you arrive. The spaces are an example of sheer elegance. Their multimedia suite, complete with the highest level of specifications, is sure to give a resounding impact with your next big presentation. 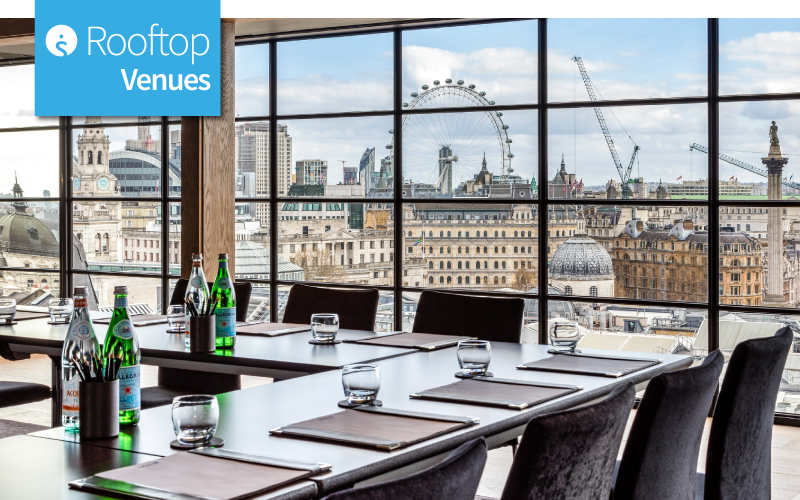 Making important business decisions with such an iconic, panoramic London skyline as the backdrop is an experience that will stay with your colleagues. This is one of the rooftop venues available to hire in London for your next party too. The Hampshire Penthouse is the ideal place for VIP gatherings where the stunning views provide an excellent setting. With the capacity to seat 72 guests or 120 attendees standing and with the views of the Nelson’s Column and Big Ben, your corporate celebration or event will be one of the most memorable ones. A hidden gem of a rooftop terrace in the heart of London’s West End is keeping guests and delegates happy at the Theatre Royal Drury Lane. Not only is it home to some of the most exciting shows and theatre productions, it is also a place that can make your meetings productive with its exceptional boardroom facilities. The London theatre is complete with the latest technology as well as its unique setting. The stage is set for keynote speakers to deliver an important presentation or company message to over 2,000 delegates in the theatre’s auditorium. For smaller events, the regency style boardrooms give a feeling of royalty, certain to inspire delegates. The Grand Salon is super stylish and seats up to 350 guests. For a smaller, more intimate formal gathering like a board meeting, opt for the North and South Rooms, where spaces have been created for private groups of up to 20 people. The feeling of conducting a business event in a place brimming with a rich history and held in such an elegant setting it sure to have your audiences calling for an encore! And if you are wanting the thrill of rooftop venues in London too, the Theatre Royal, Drury Lane is an exciting choice. A corporate event or big business meeting doesn’t have to be a dull! Add some a touch of the high life to a meeting by hiring one of these rooftop spaces and watch your team’s productivity come to life! Whether you are looking to create a modern-chic summer BBQ vibe or a more elegant, traditional feel, these options will impress. Next Post:An illuminating Christmas in Blackpool!